No need to beat about the bush – let’s go! This one is very important, as getting it wrong can (and most often will) kill your pedal. What type of power does the pedal expect, and what type does the adapter put out? 90% of all pedals use DC voltage, so in almost all cases, this is what your pedal needs. DC – for Direct Current – is the same type of voltage found in a battery, so if your pedal uses a regular 9v battery, most likely this is what the pedal will want to see at the adapter jack as well. But you need to know for sure, so check the label on the pedal (or the manual, or the manufacturer’s website). If the pedal says it wants DC voltage, double check the adapter as well – again, the label will tell you everything you need to know. Make sure it says ”DC” or has a straight line (sometimes with a dashed line underneath) as part of the symbol. A few pedals use AC voltage, though, and those are important to look out for. AC voltage is indicated by a wavy line (if it doesn’t say ”AC” outright), and while it is vital for the pedal that needs AC, it is also deadly to a DC pedal. So whatever you do, do not get these mixed up! If you have a pedalboard with both DC and AC pedals on it, make sure to label/mark the AC cable at the pedal end, to help you avoid accidentally plugging it into a DC pedal. Note: while we often say ”AC adapter” about the ”wall wart” thing that plugs into the wall, it is a little misleading. So much so, that on some old Electro-Harmonix pedals, the label by the adapter jack even said ”AC”, even though the pedal used DC voltage… The correct – albeit more bulky – term is ”AC->DC adapter”. Having deduced which type of power you need, it’s time to look at the number before the AC or DC sign. Again, the question is the same – what does the pedal expect, and what does the adapter put out? In most cases, the answer will be 9 volts DC (the same as in that 9 volt battery), but there are exceptions out there. Also, some pedals can deliberately be powered with different (usually higher) voltages, which may change their sound and response. Then again, most can not, and some will even be damaged by going just a couple of volts above what it is designed for. The ground rule is to always stick to the manufacturer’s recommendation, unless they specifically say otherwise. The thing to remember is that voltage is pushed into the pedal by the supply, so the output voltage from the supply needs to match what the pedal requires. The above image shows not only the input voltage (9) and type (DC), but also how much it needs. Different pedals use different amounts of current, measured in milliamperes (”mA” for short). With just a handful exceptions, pedals will use the same amount of current whether they are turned on or off. The supply has to be able to provide more than the total current draw of the pedals being powered. I usually make sure to leave at least 30% ”wiggle room” there, so a 100mA pedal needs at least a 130mA supply. 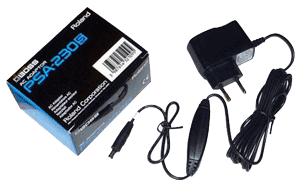 Often, the figure mentioned by the manufacturer is their recommendation as to how much current a supply should have, or even the amount of power their own adapter (shipped with the pedal, or sold separately) can provide. In these cases, the actual current draw will be less, and sometimes The Power List will have an actual, measured, figure. But when in doubt, follow the recommendation. In contrast to voltage, current is pulled from the supply by the pedal, so you can’t have too much. The pedal will only ever take as much as it needs. DC voltage always has a positive and negative, and they need to end up where the pedal expects them to. Remember the bit about the voltage being pushed into the pedal? If you get + and – mixed up, the supply will try to push the voltage in backwards, which can lead to disaster. Thankfully, most pedals these days have polarity protection to prevent damage in this scenario, but sometimes the protection diode gets sacrificed in the process (leading to a non-functioning pedal, until that component has been replaced). So make sure you know, before you plug the power supply into a pedal. Almost all pedals these days use the same type of barrel-style plug, and the center pin (in the pedal’s adapter jack) is normally wired negative, with the positive carried on the outside of the plug barrel. This is called ”center negative”, and the symbol for that is fairly self-explanatory. A few use the reverse configuration – again, the symbol is clear. But make sure you know. And as with AC cables, if you have any reverse polarity plugs on the pedalboard, make sure they are marked, to avoid confusion. Sometimes you can, and sometimes you can’t. It isn’t due to the way the adapter jack is wired, but the way the voltage is applied in relation to ground. This is really only an issue with (some) germanium fuzz/octavia or Rangemaster-style treble boosters, and you can read more about it here. While it may be tempting to go to your local electronics store and just buy the cheapest power supply/wall wart adapter they have, this is not recommended. Guitar pedals are often fairly simple creatures, and if the power supply isn’t intended for this specific use, it will often cause noise. Some may also put out a higher voltage than specified, when there’s only a light load (such as a guitar pedal) on them. The key word is ”regulation” or ”regulated”. This means that the voltage will be at the specified level, regardless of the load. Unregulated DC adapters are to be avoided, since they will vary the output voltage with the load. 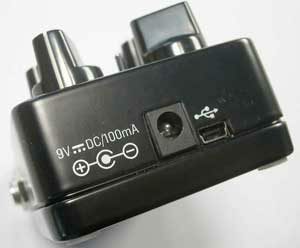 An unregulated 9vDC adapter can often output 12-15 volts, until there’s a fairly substantial load put on it. Basically, buy a power supply that is specifically meant for use with guitar pedals, and you will save yourself lots of headaches. That’s it! Or maybe not… 🙂 Those were the basic ground rules, but of course there’s far more to cover. Check out the ”How to power your pedals” and ”Top tips on daisy chaining” articles, if you want to know more. Splitters, voltage and current doublers - what's all that about?